In 1944, Flight Lieutenant David Errol Chance flew Beaufighters for Coastal Command with 603 Squadron against enemy shipping in the Aegean Sea. The Jamaican joined 248 Squadron in January 1945, and piloted Mosquito fighter-bombers for Coastal Command on anti-shipping strikes in the North Sea in the last weeks of the war. 34 Elementary Flying Training School, 16 September 1942-12 November 1942; 41 Service Flying Training School, 13 December 1942-14 April 1943; 31 General Reconnaissance School, 6-27 May 1943; 3(Pilot’s)Advanced Flying Unit, 2 September 1943-20 September 1943; 1531 Beam Approach Training Flight, 22-28 September 1943; 3(Pilot’s)Advanced Flying Unit, 1 October 1943-6 March 1944; 79 Operational Training Unit, 13 June 1944-4 August 1944; 603 Sqdn, 31 August 1944-30 November 1944; 248 Sqdn, 8 February 1945-18 July 1946. David Errol Chance was born in Jamaica on 27 February 1923 and educated at the island’s Munro College. In June 1941, while in the United Kingdom, he volunteered to join the Royal Air Force and was selected to train as a pilot. Chance learned to fly in Canada and returned to Britain as a Pilot Officer in July 1943. He was promoted to Flying Officer in October and later posted to the Middle East, joining 603 (City of Edinburgh) Squadron at Gambut, Libya in August 1944. Flying a Bristol Beaufighter, the young Jamaican participated in a number of strike operations against enemy shipping in the Aegean Sea. In January 1945, Flying Officer Chance was posted to 248 Squadron, which operated as part of the strike wing based at Banff in Scotland. In the last weeks of the war he flew De Havilland Mosquito fighter-bombers on a number of successful anti-shipping operations around the coasts of Denmark and Norway. Chance continued to fly with 248 Squadron until July 1946. 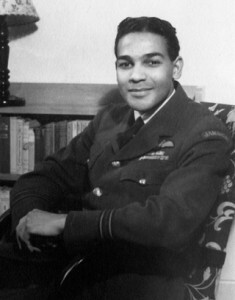 Thereafter, he was employed at Coastal Command and by the Colonial Office as a liaison officer responsible for the welfare of West Indian airmen. David Chance left the RAF as a Flight Lieutenant in July 1951.
he settled in England, opening an antiques shop in London’s Portobello Road.